Ah, Nelson. Where to start? What a wonderful, varied, interesting part of the country! As mentioned in my previous post, our visit to this northern city on the south island began with a trip to see Bob, a friend we met on the plane from LAX to Fiji. Bob lives in Glendaun, a bedroom community right outside of Nelson city. A great storm blew us into his town, and we took shelter inside his lovely home enjoying a homemade dinner that included green-lipped mussels (a specialty on the south island—YUM! ), local fish, and chard (known as silverbeet here) grown in Bob’s backyard. The view from our hike in Glendaun. Our new friend Bob with Jeremy. Bob had some errands to take care of, so Jeremy and I continued up the hill a short ways. 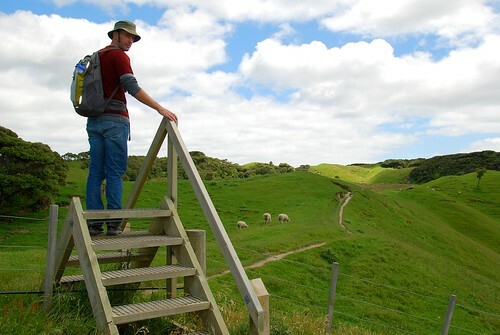 Now, as is often the case with hikes around New Zealand, there were sheep grazing all over the trail. Incidentally, I finally understand the origin of the phrase “feeling sheepish.” These guys are real scaredy cats! If you get within 25 yards or so of them, they go running. So, it was particularly surprising when the little guy pictured below decided to get tough with us and baaa’d us off his field. He must have followed us for about 10 minutes, baa’ing loudly and continuously. I was imagining he was the big, bad sheep of the field, kinda like the Fonz, getting all the girls and showing the other sheep who was boss. Let’s see him try to jump a shark, hmm? Bob sent us on our way with a page full of notes on places to visit during our stay on the south island. 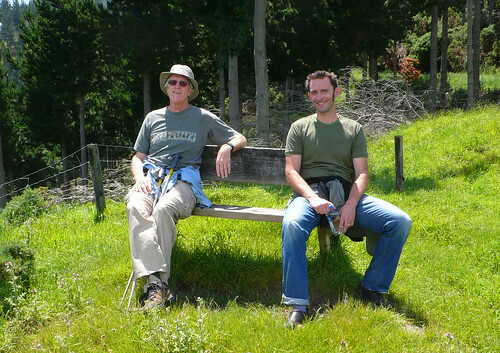 We’ve pretty much done everything Bob has recommended, including stopping at restaurants he mentioned and hiking trails he’s tramped (that’s the Kiwi word for hiking). I gotta say, Bob’s got a pretty good program! We think he should write a guide book. First stop on “Bob’s Tour of the South Island” was Marahau, where we camped for the night so that we could hike in Abel Tasman Park the following day. You can hike into the park from Marahau, which is a long way, or you can take a water taxi and hike only the nicest parts of the park (Torrent to Bark Bay). For NZ$62 (approx. US$37) per person, you get dropped off in Tonga Bay (north of Bark Bay) at 10AM and picked up in Torrent at 4PM. We did the hike in about 3 hours and then hung out on the beach the rest of the afternoon waiting for the taxi. You could probably take a later taxi into the park (they have taxis that can drop you off at 11:45AM) but we thought the hike was going to be more like 5 hours long so we hitched the earliest ride we could. The water taxi drop-off in Tonga Bay. 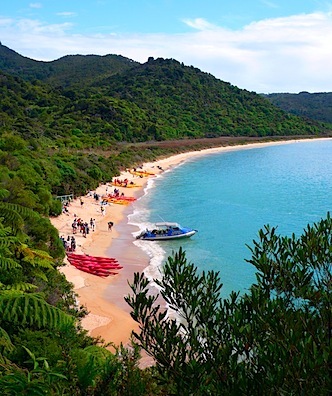 We heard a lot about Abel Tasman park, but honestly, we weren’t that impressed. The bays were really beautiful and it was fun to see some of the native vegetation (ferns galore), but it was by far the busiest hike, er, tramp, we’ve done. The whole thing felt a bit “packaged” to us. It is quite possible that the coastline was not as stunning as it usually is due to the storm. Our water taxi driver said that the water is usually crystal clear but due to the heavy rainfall the day before, silt and dirt were clouding the water. That night we drove towards Takaka, which is about halfway between Marahau and Cape Farewell, our next destination. 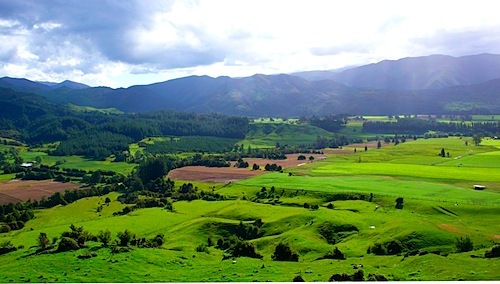 As you drive over the hills into Takaka, you pass through the most beautiful valley. We camped in Pohara (Pohara Beach Top 10: www.pohara.com/paradise), which was a gorgeous campsite on a stunning beach. We highly recommend staying here rather than in Takaka, as it is much more tranquil and only about 10 minutes out of the way. The next day we headed out towards Cape Farewell, which is the very northwestern tip of the south island. There is a long “finger” of sand that juts out from the land, creating a bay. 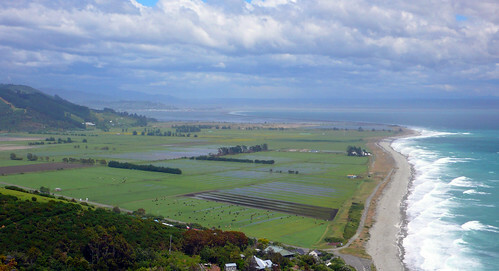 The “finger” is known as Cape Farewell Spit and it is a protected bird sanctuary so there is limited access to the area. You can, however, go on tramps to the west of the spit. Second stop on “Bob’s Tour of the South Island”: Whariki Beach (”wh” is pronounced like an “f” in Maori, so this is actually pronounced “Fah-ree-kee”). 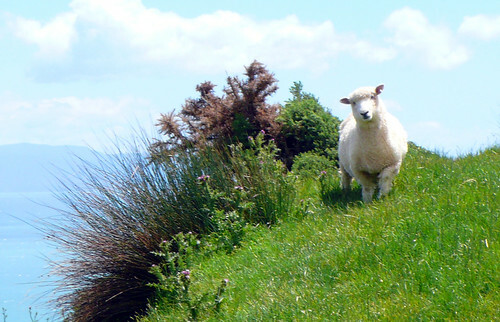 This tramp started out as usual, grassy fields and rolling hills covered with grazing sheep. Then, incredibly, you hike over another hill and it is a vast expanse of gorgeous, deserted white sand beach. 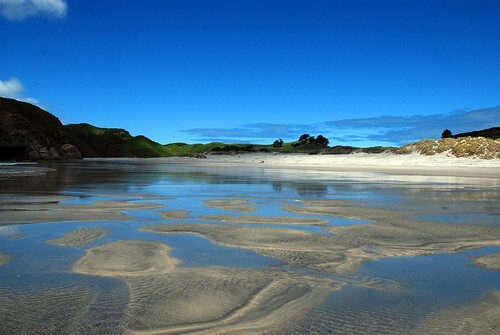 Just like that: one minute: rolling hills and sheep; next minute: incredible deserted beach. 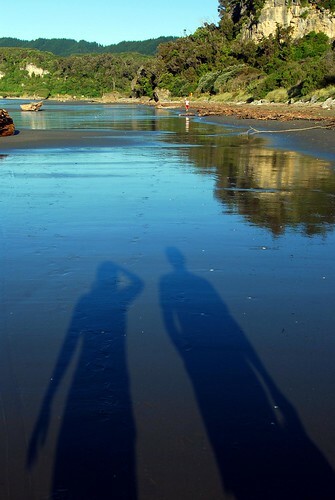 We had heard that Whariki Beach could be uncomfortably windy, but we lucked out! 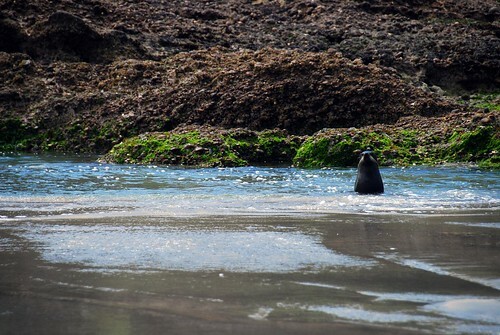 There was a very light breeze, the sun was shining, and there were even seals swimming in the ocean and peeking their heads out to observe us. I mean, I felt like the I was in the group at Burning Man that wandered off and got grilled cheese sandwiches, mojitos, and a cold water head dunk (some of you will know exactly what I mean by this…others, you can figure it out). 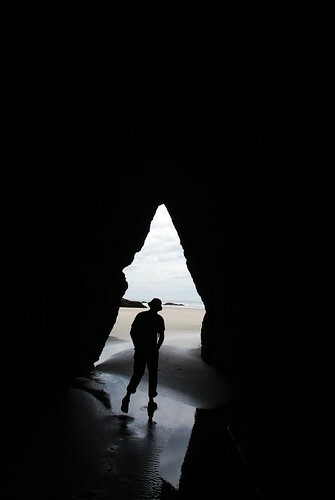 Whariki Beach is also known for its caves, and we spent the better half of the afternoon wandering in and out of them. Be careful—there may be some grumpy seals hiding in those caves! For the life of us, we couldn’t understand why Abel Tasman was swarming with people and this place was completely deserted. It is quite a bit of a haul out to get to Whariki, but it is entirely worth it. If you ever find yourself even moderately close to this corner of the world, GO! And cross your fingers that it’s not windy. Next stop on Bob’s tour was Nelson Lakes, where he recommended that we hike the Mt. Roberts loop. It’s a pretty steep, steady 1 hour climb to the top, and then 2 hours downhill, but each part of it is beautiful and interesting. 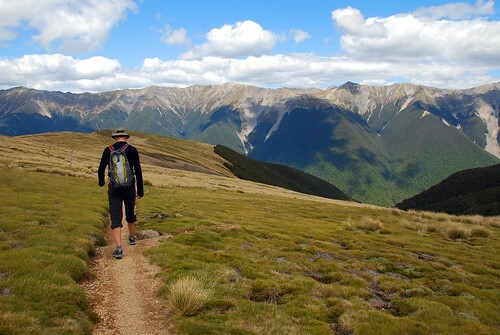 I know Jeremy said it before, but I will say it again: we can’t get over how accurately Kiwis estimate the hiking time, especially since we are usually hiking at an above-average pace (that’s what we think, anyway). The nice guy at the information center (known as I-site) told us it would take 3 hours for us to do the hike, and that’s exactly the time we clocked. I guess Kiwis are really strong trampers! 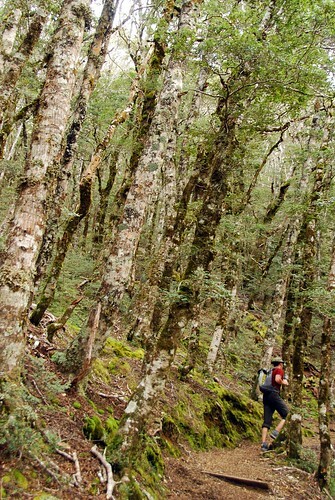 We did a lot of hiking in the Nelson area, and I think that is a testament to its incredible natural beauty. Nelson, we love you! At the Mt. 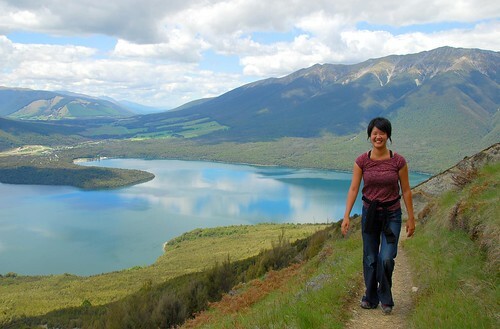 Roberts summit overlooking Lake Rotoiti. 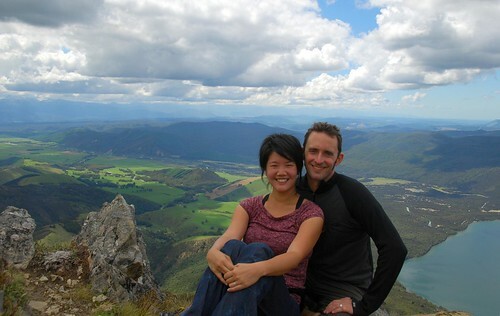 Hi Hope & Jeremy, I’m so impressed with the natural beauty of NZ. You brought so much greens & blues to my eyes, it’s so soozing, make me forget the daily grind at work. Thanks.